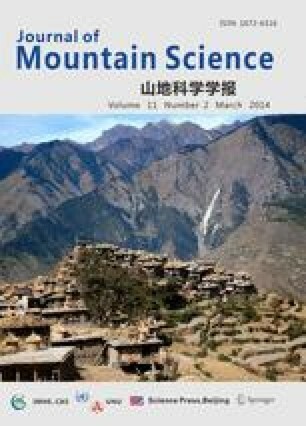 Using political ecology as its conceptual framework, this paper focuses on the changes in forest utilisation and management of South Kyrgyzstan’s walnut-fruit forests over the last century. The aim of this study on human-environment interactions is to investigate the relationship between actors on the one side, their interests and demands, and the forests and forested lands on the other. Forest resource utilisation and management — and even the recognition of different forest products as resources — are connected with political and socioeconomic conditions that change with time. The walnut-fruit forests of South Kyrgyzstan are unique, characterised by high biodiversity and a multiplicity of usable products; and they have been utilised for a long time. Centralised and formal management of the forests started with the Russian occupation and was strengthened under Soviet rule, when the region became a part of the USSR. During this era, a state forest administration that was structured from Moscow all the way down to the local level drew up detailed plans and developed procedures for utilising the different forest products. Since the collapse of the Soviet Union, the socio-political and economic frame conditions have changed significantly, which has brought not only the sweeping changes in the managing institutions, but also the access rights and interests in the forest resources. At present, the region is suffering from a high unemployment rate, which has resulted in the forests’ gaining considerable importance in the livelihood strategies of the local population. Political and economic liberalization, increased communication and transregional exchange relations have opened the door for international companies and agents interested in the valuable forest products. Today, walnut wood and burls, walnuts, wild apples and mushrooms are all exported to various countries in the world. Scientists and members of various international organisations stress the ecological value of the forests and are trying to establish nature conservation areas. Nevertheless, it is to fear that a multiplicity of interrelated factors — the present transformation and globalization processes, the appearance of new actors, the local populations’s insecure economic situation and the erosion of managing institutions — are all leading to an intensified and unregulated exploitation of the forests, resulting in their degradation.